Three convicted of planning to murder Jewish teachers in Iran-linked plot. 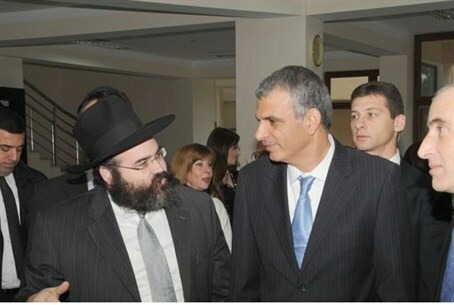 Three Azerbaijani men have been convicted of planning to murder Chabad rabbis at a Jewish school in Baku. The three have been named as Rasim Farail Aliyev, Balagardash Dadashov, and Ali Alihamza Huseynov. The planned attack was to be revenge on Israel for the death of an Iranian nuclear physicist. Iran suspects Israel of being behind the deaths of several of its nuclear scientists. Dadashov, who has contacts in Iranian intelligence agencies, initiated the murder plot, promising Aliyev $150,000 if he would murder foreign citizens in Baku. The three men smuggled bombs and guns into the country as part of their preparation for the slayings. At the time of their capture in early 2012, they had already purchased vehicles and had prepared maps and photographs of their intended victims. They were found guilty of plotting the assassination of public officials and weapons smuggling. Aliyev, the ringleader, was jailed for 14 years, while his co-conspirators were given sentences of 13 and eight years.